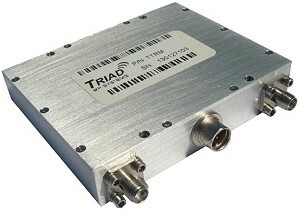 October 30, 2017: The TTRM1119 LDMOS amplifier operates at a frequency range of 2200 MHz to 2500 MHz and has a power output of 25 watts, while still maintaining a compact form factor of 3.33 x 2.69 x 0.65 inches. This unit also features internal protection against over/under voltage and excessive temperature conditions, which coupled with its rugged construction, ensures fault-free operation in even the most extreme environments. This class AB LDMOS module is designed for both military and commercial applications. It is capable of supporting any signal type and modulation format, including but not limited to 3-4G telecom, WLAN, OFDM, DVB, and CW/AM/FM. The latest device technologies and design methods are employed to offer high power density, efficiency, and linearity in a small, lightweight package. Copyright © 2017 Triad RF Systems, All rights reserved.